Sir, please cross your legs on stage. That’s unladylike. In the last month, I have seen Merry Wives of Windsor, Bedlam, Les Miserables, 39 Steps, and The Habit of Art, which is significantly more theater in a very short time than I’ve been able to see in the US. So that being said, I have to get my initial gushing about how excited I am that I’ve had this great opportunity and how it’s really great that London makes its arts so cheap to attend and accessible to the public. I say this mostly because I’m genuinely thrilled. I really can’t get over how awesome it is that I get to see all this stuff as part of a class for really cheap. I think that although Kate Fox talks about the English egalitarian sentiment as a largely hypocritical façade for a very unequal class system, the English really do an amazing job of making beauty accessible to everyone – free museums, cheap theater, beautiful parks, etc. (I also say this because my mom keeps reading my Dickinson blog – hi Mom! – and it’s a super cranky blog because American Studies has trained me that when I analyze, I must be angry and critical of society). But anyway, everyone has already talked about the accessibility of beauty. So I’m going to do the other thing that American Studies has trained me for: talk about something inappropriate and pretend it’s academic. Today’s topic is cross-dressing. Out of all the plays I’ve seen, Les Mis was the only one that did not contain a prominent cross dressing scene, and it’s not English in origin. Bedlam was so intent on having a cross-dressing scene that it didn’t even matter that there was no explanation for it in the plot. The Habit of Art was not even a comedy, and it still had a cross-dressing scene. What part of the English psyche demands a man in drag so intently that it has become a staple of theater? Kate Fox would probably say it’s the “importance of not being earnest,” the idea that one must never take oneself too seriously (62, 63). Serious plays must be offset by something self-deprecating and silly, and comedies must contain some form of low brow humor to offset the perception that the jokes are too high and pleased with themselves. (American Studies Jesse would at this point start discussing: 1. The sexism in the idea that a man in drag is funnier and more self-deprecating than a woman in drag because women are less valued in society. 2. The classism in the language of “high brow” and “low brow” and how it creates a humor hierarchy that perpetuates class stereotypes about intelligence and arrogance. But American Studies Jesse is going back into her angry-at-society box now, away from this discussion). What Kate Fox does not address, is why the “importance of not being earnest” specifically manifests itself in the form of men in dresses and stockings. Sexism and classism are not exclusive to England, and they’re too easy an answer. One of my theories has to do with Liz’s favorite topic, Shakespeare. Shakespeare seems to be a huge point of national pride for the English, and his plays contained a lot of cross dressing for comedic purposes, plot purposes (i.e. The Twelfth Night), and for the practical purpose that only men used to act so they would have to play women’s parts. Maybe the influence of Shakespeare has seeped its way into modern theater in the form of cross dressing. I definitely think at least Leyshon felt some pressure to write some Shakespearean humor into Bedlam since it was performed at the Globe. My other theory has to do with the absolute silliness of the men’s outfits that we saw in National Portrait Gallery. We look upon the tights, lacy and velvety frills and fabrics, codpieces, and otherwise ridiculous jewelry of the upper class men from the Tudor and Stewart line with the same out of context amusement that we see in the stupid haircuts of cool kids in our parents undoubtedly see in skinny jean leggings. Maybe the history men’s fashion, some of which is totally effeminate by today’s standards, has affected theater. Every time an English person see a man in a dress and suspenders maybe it hearkens back to the old days of the monarchy and the glory of the empire. (Fun fact: Vicky taught me yesterday that in England, suspenders are those little clasps that women use to hold their stockings up rather than straps that old people and people that enjoy ska music use to hold up their pants). I welcome any other ideas. P.S. Mom, England is very fun and educational and full non drag queen related learning experiences. Like many of my classmates I decided it would be worthwhile to summarize all of my discoveries this month in London. During this post I will focus on six main themes found within London: Parks, Churches, Pubs, Other Religious Institutions, Theatre and Museums. Each park that I visited had its own distinct characteristics that separated it from any other. Green Park was the first I visited and after perusing a few others, I realized there was nothing that exciting about it. Located right across from Buckingham Palace, Green Park certainly provides a good place to go and take a break from the busy atmosphere of the area. Besides this however there is not much going on and I would recommend that potential park goers walk the extra distance over to St. James Park. In addition to the large number of waterfowl heckling people for food which offers consistent entertainment St. James offers some picturesque flower beds throughout and various monuments along the way. It has the relaxing atmosphere of Green Park with a bit more excitement sprinkled in. Regents Park offers a completely different feel from Green or St. James. 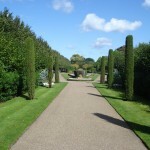 Located in a separate area of London, Regents Park has a history of being used by a higher end crowd. I could tell this immediately from the feel of the park. The decorative shrubbery and elegant architecture throughout gave me a feeling that Regents is not as well used as other parks. Since I was one of the members of the Parks group that gave a walking tour of Hyde Park and Kensington Gardens I could go into a lot more detail about these two green spaces but I will choose not to in an effort to be concise. In summary Hyde Park is the largest green space in London and is often used for larger events such as concerts, festivals etc. It also contains a large number of monuments throughout including the 7/7 memorial and the Diana Memorial Fountain. Kensington Gardens is home to a variety of key monuments but is not as well trodden as Hyde. Overall it makes for a quieter atmosphere, more conducive fo reading or “snogging”. Regents Park were my two favorite green spaces in London. Regents, is both beautiful, and extremely large and I continually felt the need to go back and explore. Kensington Gardens appealed to me in that it was quainter than Hyde Park but contained a like amount of history and monuments throughout. Although I would be content spending a length of time in any London green space Regents and Kensington would be my top choices. Overall I enjoyed going to the theatre on so many occasions. What better place to do so than in London after all? Here I will discuss my favorite performances and theatre venues. All in all I enjoyed all but two of the performances we saw. The two Shakespeare productions at The Globe Theatre were fantastic. Although I did not particularly enjoy reading Troilus and Cressida it made a huge difference to be there so close to the actors. The fantastic drum chorus at the end really sealed the deal. As You Like It was probably my favorite show I saw here in London. Although it is one of Shakespeare’s simpler plays the actors really made it jump off the page. Being down it the pit was fantastic because of all the ad-libbing and constant interaction with the crowd. I even felt traces of Touchstone’s saliva on my arm at one point. The other Shakespeare performance I saw, All’s Well That Ends Well, was lackluster. Although the Olivier was my favorite performing venue (this is what an auditorium style theatre should be like…why can’t Dickinson have something like this?) the play itself was odd and ended on an abrupt and odd note. The other play we saw at the National Theatre, The Pitmen Painters, was fantastic. Although I was dozing a bit because of the Benadryl I took right before the show, the actors kept my attention and I appreciated that the play was based off of a true story. Easily the oddest play we saw was Arcadia. An extremely intelligent performance the play juxtaposed two different periods in time and created a singular storyline in which the plot was based. Overall it was an entertaining performance that made me think early and often. Finally there was Blood Brothers. The lone musical I saw produced feelings of disbelief, anguish and held back laughter. The ridiculous 80’s sound track and creepy narrator just didn’t do it for me. I think it’s safe to say that I was not the only one from Humanities 309 who was a bit surprised to see just about everyone in the audience give it a standing ovation. I had a very positive experience with the theatre here. I would go back to the globe again and again. I loved being that close to the action. I would also enjoy seeing another show in the Olivier. There really is so much to choose from here. It’s simply a matter of figuring out your tastes and saving your money so you can see a lot of performances. From Westminster Abbey to St. Paul’s Cathedral we saw most of the major churches/cathedrals during our month in London. St. Paul’s was easily my favorite. From the fantastic crypt to the hundreds of stairs up to the tower it had so much to offer in the way of history and mystique. Westminster Abbey fascinated me primarily because of all the literary figures that had been buried inside as well as the room that was dedicated to “The Order of the Bath”. Other churches that I really enjoyed taking a look at were: “St. Martin in the Fields” which sits just outside Trafalgar Square and Nicholas Hawkesmoore’s “Christ’s Church” which is located in very close proximity to Brick Lane. Overall the Sikh Gurdwara was my favorite place that we visited. I appreciated the simplicity of the religious doctrine as well as the conviction and honesty with which our tour guide, Mr. Singh spoke. The morning was capped off with a fantastic sit down meal together in which everyone was served the same food and drink. I had different feelings about the Hindu Mandir. It was clear to me from the very beginning that the Hindu religion is not nearly as modest as Sikhism nor are they trying to be. From the extremely decorative prayer room, to the museum located right in the center of the Mandir I never felt particularly comfortable inside. The only religious institution I wish we had gotten a chance to visit is a Mosque. I had been to one many years ago but I did not remember a whole lot from my experience. I wonder how much more lively the East End, and all parts of London would be if Ramadan were not taking place during our time here. I could go on and on about museums so I will attempt to stay as concise as possible. The British Museum was massive, convenient since it was so close to the Arran House but a little one dimensional at times. One of my favorite exhibits at the British Museum was a special exhibit on Living and Dying that drew information from all different time periods and cultures. The National Gallery was fantastic. Although I have a hard time appreciating some visual art the gallery kept my attention for a number of hours. Seeing so many famous works of art was phenomenal. The Tate Modern was my least favorite museum here. Although I am trying I have a hard time understanding modern art. After about 45 minutes in this museum it ended up being too much for me. The Cabinet War Rooms/Churchill Museum were two of my favorites. The realization that I was standing in one of the most important places in World War II history was unbelievable. The War Rooms felt so authentic. I really felt as though I had been taken back in time to the 1940’s while inside. The Victoria and Albert was easily my favorite museum in London. There was so much variety inside and so much to see. I could have easily spent a few days inside. Two of my favorite exhibits were the silver and jewelry exhibits. I’m not sure what this says about me as a person but I found it unbelievable that individuals could even own such treasures. I also enjoyed the laid back atmosphere of the V&A staff. At most of the other museums I visited I felt like I was doing them a disservice simply by being there. Although I understand that taking pictures of an object in a museum doesn’t do it justice I like to be able to have the option of doing so. The Sir John Soane museum interested me but it wasn’t really my cup of tea in the end. It also had a stuffy atmosphere to it that I didn’t really appreciate. One thing I can draw from my experience at museums here is that each and every one has something that distinguishes it. With so many museums I thought that it would be impossible to avoid some overlap but I never really felt that. Cheers to London and its museums. Finally we have pubs. What would London be without it’s public houses? In some cases pubs are the true museums of London, designating what an area was like in the past and what type of clientele it attracted. During my month here I had a chance to visit a few pubs and get a general sense of what some possible differences could be. It is clear to me that each pub brings something different and unique to the table. The Marlborough Arms was convenient being so close to the Arran House and was a great place to enjoy a pint over a meal with friends. The Court was conducive to socializing in a different way. The music was louder, the people louder and the drinks cheaper. Other places I visited offered other things that made them stand out as well. One thing that i’ve learned about pubs is that it’s hard for one to please everyone. Since everyone has different tastes and desires when it comes to pubs you are better off going to one with a small cohesive group. To conclude this novel I would just like to say that I think we saw a lot of different faces of London this month. I realize there is much more to see here but between walking tours throughout the city, trips to major monuments and museums and individual exploration I have learned a ton about London, it’s history and where it is going. I look forward to more London explorations in the future but for now, ON TO NORWICH! Although I have blogged, to some extent, about most academic things I have done in London, I feel that I have a better impression of most things now than I did at the beginning of the stay. Along this vein, I feel the need to revise, or just plain state, my opinions on the “Big Five” topics – parks, churches, museums, theatres, and pubs. I have now been to five of the Royal Parks in London. Green Park, Kensington Gardens, Hyde Park, Regent’s Park, and St James’ Park are all very similar and yet very different in their own ways. I found Green Park, situated very close to Buckingham Palace, to have the most unfriendly atmosphere of the five. There is very little to Green Park. 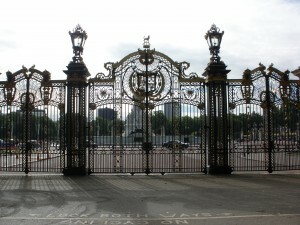 There are trees, benches, grass, the ever-popular lawn chairs for rent, and beautiful ornate gates facing Buckingham Palace. I think the reason I found the park so cold is that it was, well, too green. There were no flowers or water features (except for one fountain commemorating the Canadians), just trees, grass, and benches. This is vastly different from the other four parks I visited. St James’ Park, Hyde Park, Regent’s Park, and Kensington Gardens all were beautifully landscaped with brightly colored flowers, clean fountains, scultpures, and natural or constructed water features. In Hyde Park, Regent’s Park, and Kensington Gardens it was easy to forget that you were in the middle of a pollution-filled city. As I am not much of a city person, it was extremely refreshing for me to not be able to hear or see traffic for a while. With Green Park and St James’ Park, I couldn’t shake that feeling. However, I am a firm believer that parks, whether or not they are within city limits, always make people feel healthier. For this reason and the sheer beauty that the parks portrayed in their different ways, I understand why I did not only see tourists, but the people of London as well. 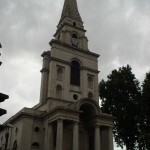 Churches and other places of worship are an integral part of societies throughout the world. Throughout our time in London, we have been fortunate enough to visit Westminster Abbey, St Paul’s Cathedral, a Sikh gurdwara, and a Hindu temple. Of these four I enjoyed St Paul’s Cathedral the most from a purely historical standpoint and the Hindu temple most from a cultural perspective. 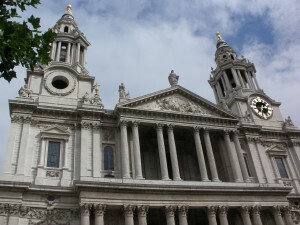 St. Paul’s is one of the most recognizable and interesting buildings in London. It not only houses some of the most important military remains in the country (the Duke of Wellington and Admiral Nelson), but it was one of the most iconic images of WWII Britain. I also found it to be less like a museum where I felt like hop-scotching around graves in the floor (Westminster Abbey) and much more like a place of worship. I enjoyed the Hindu temple for very different reasons. Although there was a definite sense of it being a tourist attraction, with the gift shop in the lobby and the interpretive centre with tiny models of Hindu gods, the temple was still very obviously, well, a temple. Before going there, I had no idea what Hinduism was like. I knew that there are multiple gods and that one is an elephant, but I didn’t know about their dedication to peace and volunteer work. What really struck me about it was that the intricate carving and craftsmanship of the facility was all done by volunteers. I think that this cultural experience was only heightened by being able to observe a service in the sanctuary that was so unlike my own Roman Catholic faith. I had very mixed experiences with museums in London. Some, like the Victoria and Albert, I just didn’t seem to understand in the amount of time I spent there. However, I think that if I went back and dedicated a day to the facility, I would appreciate how the seemingly-random exhibits link together much better. 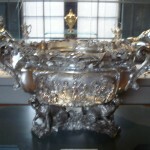 (I did enjoy the items on display in the V&A, I just had an issue with the layout of the museum.) Other museums, like the Museum of London and the Docklands Museum, were put together in a very fluid and informative manner that I enjoyed greatly. My two biggest museum issues were with the British Museum and Sir John Soane’s Home/Museum. Grace and I wrote extensively on our thoughts on the British Museum, so instead of repeating everything, I’ll just give a brief summary: why are all of these amazing artifacts that have no connection to Britain in the British Museum? Theatre is a subject I have talked about in a couple of different posts (Observations on Accessibility and Blood Painters and Pitmen Brothers), however, I have not discussed theatre in general. I was lucky enough to see Troilus and Cressida, All’s Well That Ends Well, Arcadia, The Pitmen Painters, and Blood Brothers. Each of these theatre experiences were extremely different, but all valuable in their own ways. Troilus and Cressidawas shown in the Globe Theatre and we had groundling tickets that forced us to stand for the 3 hour performance. The actual standing wasn’t nearly as bad as I thought it would be, but the best thing about the show was being quite literally three-to-four feet away from the actors on stage. (Actually, it was slightly amusing when Hector died and was lying 3 feet away in our line of sight for the last 20 minutes of the play!) The staging of this Shakespearian play was vastly different to All’s Well That Ends Well, which was put on in the National Theatre. In the Globe, the sets are quite minimal because they have to perform four or five different shows on the same stage in the space of a few days. The set for All’s Well That Ends Well was much more elaborate and specialized for the show. Rather than the reliance on the actors and the costumes that the Globe used to tell you where the play was occurring, All’s Well That Ends Well used a dark set with elaborate staircases to add to the mood of characters and the dialogue. Much like with Troilus and Cressida, the set for Arcadia was also pretty simple. Although the play took place in two different years, it was set in exactly the same room with almost all of the same props. This was a very effective way to stage the show and allowed for the writer, Tom Stoppard, to do some very interesting things with the characters from both time periods, like when he had them all in the room at the same time, oblivious to each other. I particularly enjoyed the way that this play was set and how basic it was. It was vastly different from the more complicated sets of The Pitmen Painters, which included projection screens, and Blood Brothers, which had lots of windows for the Devil/God character to peer creepily out of. This final subject I have not blogged about at all. Pubs are an integral part of British culture. 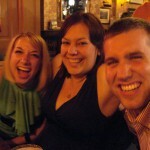 That said, pubs are also an integral part of Irish culture, so I experienced pub life when I lived in Ireland. British pubs and Irish pubs have a lot of similarities and differences. In both places, you must push viciously up to the bar in order to get your food and drink, you have to be 18 to have alcohol, smoking must be done outside, and there are usually way too many people in the pub for you to feel comfortable. Oh, and you always pay way more than you think you should for your drink. I’ve been to a couple of pubs in London and have found that they are all fairly similar. The bartenders are nice, but kind of frantic; the food is good, and usually relatively cheap; and the music is God-awful 1980s or techno playing at volumes that are way too loud. The first two are cohesive with pretty well every Irish pub I’ve ever been in, the third is not. Irish pubs play good music… or at least much better music than I’ve heard here! There are a lot of pubs that have a band playing traditional Irish music in front of you in the pub for pints and there are also a lot that play modern music at volumes that make my ears want to cry – but at least the music isn’t a Cher and Meatloaf duet accompanied with the weirdest music video I have ever seen in my entire life. (This particular musical masterpiece was played in The Court the other day. I never would have thought of that particular combination, but oooooookkkkkkkkkk.) Truth be told, I just want to find a comfortable pub with some good music and that will make me just as happy as George Orwell’s fictitious Moon Under Water. The Pitmen Men Painters versus Rubbish just like Marilyn Monroe…. So this past week has been filled with a variety of theatre experiences that have made me laugh, think, cheer, clap, be moved, and even ask “wtf.” The two pieces that I would like to focus on, completely juxtapose the other, but nevertheless illustrate London’s diversity in the theatre going experience. Both this play and the musical made me ask questions, but in two completely different ways. On Thursday just after finishing my practice for the Brixton group walking tour, we rushed over to the Globe theatre. Since we had been there before, we knew that the play was going to be wonderful, and to our surprise it didn’t disappoint. However it was the evening play,that would make me fall in love with British theatre. After grabbing a bight to eat and relaxing at the hotel for a moment, Flo, Jeyla, and I headed towards the National theatre. I was not at all excited for this performance, in part because I was exhausted from the days’ events and partly because I didn’t want to sit through a second three hour play. Little did I know that from the beginning of the play I would be on the edge of my seat, completely drawn in to the characters of The Pitmen Painter’s. Immediately when the play began I was forced into the lives of these diverse men of the working class. The “realness” and authenticity that each actor/character brought to the table was extraordinary and noticeable from the first moments in the play. As the play continued I was lost in a world that I had a deep connection with. The symbolism for art and their understanding of it was beautifully connected to how these men lived. They learned that it wasn’t fame, or money that made u successful as artists but their ability to paint. This had a profound effect on me and my connection to dance. For years and even to this day, I imagined my life as being a professional dancer, but because of this amazing opportunity I had to grow as a student in a higher academic institution, I put my plans on hold. The Pitmen painters made me realize that not only do I still have time to do all that I want and more, but that what makes me a dancer and choreographer is not the fame and recognition that o would receive for my pieces, but my ability to create dances and the satisfaction that I get from performing. It isn’t about anybody else, and I thought that the Pitmen Painters taught me something that I was never ever to realize before and I am grateful to have experienced such an amazing piece of work. However, on Saturday going to see Blood Brothers I felt like I my ears were going to bleed to death because of how terrible it was. Blood Brothers is easily the worst “musical” I have ever seen in all my life. In the beginning it seemed as if it would be a great performance and because it was a musical I was way more excited than the other performances. But I was sadly mistaken. The play began with the potential of being a well performed musical, until Marilyn Monroe. She was, throughout the entire bloody musical, and the funny thing, is that she has been dead for decades, but I can tell you after Blood Brothers she is no longer resting in piece. The singing was great but I could not stand how everyone overacting. The most dreadful part was the narrator, playing god. At every turn he would come in and ruin a scene that had the potential of being somewhat descent. At the end of the performance the rest of the crowd gave a standing ovation, while the Norwich Humanities group looked in awe questioning the sanity of the rest of the audience. Overall my theatre going experience in London was phenomenal. London has the most diverse performing art venues I have ever witnessed. From Shakespeare to Dickens and all the in-between whatever you want to see you can find in London. Most of the plays were amazing and the theatres and their architecture was unique in every way. All in all I can say that I have fallen in love with British theatre, and I can’t wait to return. Having viewed both Shakespeare’s As You Like It and Mr. Lee Hall’s new play, The Pitmen Painters within three hours of each other it is hard not to compare the two. At first glance they seem wildly different. Shakespeare’s comedy is about courtiers pretending to be poor, while Pitmen focuses on members of the lower class themselves. One is set in 17th century France, and the other in World War II England, and not any England, but in Ashington, a small suburb of Newcastle in the dreary northern region of Northumberland. One focuses on the trials and tribulations of Love, while the other is a poignant look at stereotypes and one’s duty to oneself. In short, they are describing two very different types of England. Yes, As You Like It is set in France, but that was simply Shakespeare’s way around censorship laws. He describes an idealistic England, filled with courtly love and beautiful scenery. He portrays the rural working class as idiots without a whole brain between them. Indeed, that is the way Shakespeare usually describes the lower classes. His plays usually feature courtiers of some kind, and the poor are usually treated as comic relief, if not with outright contempt. This is rather ironic considering his audience was mostly the working class of London, though since his patronage came from the court, perhaps not entirely surprising. It is almost the exact opposite with Hall. He chooses to glorify the common man, while members of the upper class come off looking silly, or just plain sad. I took the character of Mr. Lyon as rather a fool. He couldn’t really see art until he saw it through the eyes of the uneducated pitmen, and when he left to be a professor he lost any sense of artistic discernment, or even humanity, that he had left. He became a shell of a man creating mediocre art. It seemed to me that he learned nothing from his time in Ashington, except that he could never see things as clearly as Oliver, so he ran away and hid behind his books. The pitmen, on the other hand, are the ones that can truly understand the meaning of art. These men who stopped school at ten, who spend day upon day deep in the ground outshone someone who spent his life studying art. Mr. Hall breaks down the stereotypes of modern England. As with Billy Elliot, the underprivileged prove themselves to be more than just hard laborers and thugs. A lot of Hall’s own history went into the writing of his two most well known plays. He was from a small mining town in Northumberland. Instead of wanting to paint or dance, he wanted to write, something that was frowned upon. He overcame the judgments of his friends and family, and the challenges set forth by society, and he is now a successful playwright. Like the author, the pitmen become a huge success, despite the hardships that accompany the journey. I think it was very eye-opening to have viewed these two shows back to back as I did. Though they are divided by stretches of time and different subject matters, it was interesting to see the ways different playwrights interpret English life. Shakespeare’s portrayal of rural life as happy-go-lucky is a stark contrast to the gloom of Hall’s mining town. They were both excellently done performances, and as such they left me considering the way in which I perceive English culture as a whole. A couple weekends ago, a fellow classmate informed me that William Shakespeare is the best author of all time. Though I disagreed wholeheartedly with him, it seems that I am in the minority on this point in London. Shakespeare hasn’t been alive for many years now but (as many people have noted before me) his presence is still incredibly pervasive in English life. The revised version of the Globe Theater is filled nightly with people clamoring to get a taste of the authentic Shakespeare experience. Right across the river, the National Theater makes sure to have a Shakespeare play in its rotation regularly- something that is always well attended. After watching an entertaining but incredibly over-the-top version of Troilus and Cressida, I was prepared to write a blog about how Shakespeare in England has turned into just another tourist attraction. I paid more attention to the audience at the National Theater’s presentation of All’s Well That Ends Well though and realized that I saw more people than those who toted fanny packs around the city all day (items that I’m happy to report I have seen only a small number of). The over one thousand seats that the theater has were filled with more than a few tourists but also many who actually knew what the correct response to ‘cheers’ is (something that I’m still trying to figure out). So what? Two major theaters are showing Shakespeare plays- is that so exciting? Maybe not. But walking along the streets, you are guaranteed to see big posters advertising for Jude Law in Hamlet, Judy Dench in A Midsummer Night’s Dream, and other celebrities in lead roles in Shakespeare’s plays. Clearly, the man is still alive and well in London. Again, this might not seem that interesting considering he is known as such an infamous figure not only in the arts but in history in general. But the man has been gone for over 300 years now! Many other playwrights have produced excellent works (some that are arguably even better than anything Shakespeare has ever written) yet none of them have their shows playing in multiple theaters across the city or in annual festivals. I can’t accept that his popularity still hinges on the fact that he’s Shakespeare. Even the brightest star eventually fades away. I wonder the attraction and/or loyalty to the bard isn’t more a devotion to something else- a devotion to a desired ‘English’ identity that is found in the infamous Shakespeare. This may be a stretch but it could be an interesting point to consider. While I was surprised to see so many London locals interested in seeing a Shakespeare play, the audience was not an incredibly diverse one at either show. The locals that were at the show were seemingly (by this untrained eye’s standards) predominantly middle-upper class, white, elderly people. There are exceptions to every rule, but this was the crowd that I most observed while there. This isn’t to say that the theaters were too pricey for the majority of Londoners. You can buy a ticket to stand in the Globe for five pounds and a ticket to sit in the National Theater for ten. While some might not have money to throw away to the theater, five pounds for entertainment is truly reasonable. Still, despite the reasonable prices, the crowd that was attracted to the show seemed to be of a certain stature. I think it’s also worth noting that neither of these shows is considered one of Shakespeare’s big hitters and yet each theater was filled as one might expect for a Hamlet or Macbeth production. Clearly it’s not the show that is so attractive but rather the playwright. And why? I would argue that Shakespeare represents an identity of old London. He represents a more homogeneous London. London today is anything but homogenous. It’s incredibly diverse and is only becoming more so with each day that passes. With the word of the trip being ‘juxtaposition’, this diversity and change is clear to even the eye of an outsider. Is holding onto Shakespeare as an image for the ‘good ol’ England a means of coping with these changes? England has had many famous icons throughout its history but few (that I’m aware of) have been so closely connected to their national pride/make-up. So while the Beatles might have brought fame to the country, Shakespeare painted a picture of what English society was like. It was a society that may have been full of class division but one that knew the Classics, was incredibly mannerly, and conversed in witty and intelligent ways. Is Shakespeare’s continued prevalence a means of keeping that identity in place? I’m not entirely certain. An argument could be made on either side. Maybe people truly never tire of his shows. I would suggest that after three hundred years, picking up some Tennessee Williams or Eugene O’Neill might be a good idea. Today was a day filled with the inner workings of British theatre. I began my day with an early morning walk to a nearby Starbucks. I ordered my usual Caramel Marchiato with extra caramel, in order to get myself prepared for a fun filled day learning of British theatre. On my walk back to the hotel, I pondered what today’s adventure would bring? Once I arrived at the hotel it was time to begin our discussion with a Dickinson Alumni. Rick Fisher class of 1979, attended Dickinson college and in his first semester of senior year traveled abroad to London. During this time he fell in love with the theatre and when he graduated moved to London to pursue a career in the theatre. Since then he has two Tony Awards for his lighting direction in one particular play Billy Elliot, and a second one I cannot remember. As he was speaking today about his journey as he worked his way from the bottom of the barrel to becoming a Tony Award I could not help but think of my own future goals after college to become a professional dancer and choreographer. I never thought of Dickinson as a institution in which one could professionally develop a career in the arts, but after hearing of Rick’s journey, it has now become a possibility that is not beyond reason. His words and passion for his career, inspired me to further carryout my plan to dance after my Dickinson education ends. As he informed us, the business is not an easy one, but his dedication, and love for the theatre made me realize that the challenge makes it all the more rewarding. At 11:30 the class broke for a quick lunch and then headed out for a tour of the National Theatre. Our tour guide did a phenomenal job taking us about the massive structure, as she explained how not only the productions were made possible, but of how much goes in to putting on 6-9 productions a day. It never occurred to that so many intricate details when in to putting on a play. As we toured through the national theatre, our tour guide stripped down, our fantasy world of what we all imagined the theatre to be, and showed us how the work of everyone was important to putting on a successful production. The tour was very similar to the Walt Disney/Warner brothers tour of the lot in Los Angeles California where they film major Hollywood television shows. On both tours the tourist is able to get a real sense of not only the work of the actors but the work of the collective, it is a realization to an audience member that so much is required for a production of this scale, just for our entertainment. Following the tour the group headed back to the hotel, and capped of the night with the play, All’s Well That End’s Well. After learning of all the intricacies to making a play I was able to appreciate the work all the more. From the acting, lighting, costumes, props, and everything in between, the performance was astounding. The only problems I had with the play was the ending. For the sake of my fellow peers that will see the production in the near future, I will not ruin the ending however, I will say that the lead female is the dumbest girl in Shakespearian history. Still production was enjoyable, and having been in the theatre just hours before the set was up, it was great to see the final piece of the production. An experience I won’t soon forget. London is a city where the past is constantly present. What do I mean by that? Different countries maintain a dialogue with their history in a different way. Some countries are older than others. For example, in Argentina, where I come from, there are some plaques and monuments, but not so many as in England. One of the obvious reasons is because Argentina is a much younger country of only 200 years, and therefore has less history. But I do not think this is the main reason. In London, I get a feeling that time is cyclical, and that history comes back to us in many forms and shapes. We see it present on the street, in houses, in museums, in pubs and in its people. During our trip, Prof. Qualls has been using the word juxtaposition. Indeed, in London we have found that not only architecture presents juxtaposed old and new buildings, but also different situations, like the helicopters during our play at the Globe theatre. I want to use a more complicated word which I am not sure if I made up since I am translating it from Spanish: trans-textuality. By this I mean the dialogue between two texts or two authors. While this is common in literature since most texts have their foundations on previous texts, it is a technique that is most common in Shakespeare and that I’ve been founding in London in general. This idea that if we build a new building, we will find the remains of others. Like we saw on our Roman walking tour. If a family moves to a new house, they will probably discover who lived there, like we saw in our Bloomsbury walking tour, and the many plaques saying the personalities who lived in the different houses. If I go see a play, trans-textuality is always there. It can be Troilus and Cressida, a story built inside another story (the Trojan war), or Arcadia, by Tom Stoppard, which also dialogues with the past and real life English characters such as Lord Byron. Being in a city as old as London makes me constantly question about the past, from who has lived in what we now know as the Arran House Hotel, to what will my mark be, as the story of London progresses.